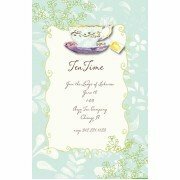 This 6" x 8" invitation is perfect for a bridal tea, Sip and See and more. White envelopes includ.. 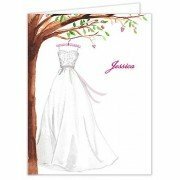 This charming 5.75" x 8.75" invitation is perfect for a bridal shower, luncheon and more. 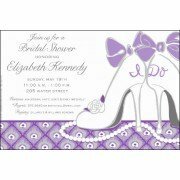 White e..
A cute bride-to-be, wearing a veil sits atop a blue box with her wedding bouquet at her feet. Col.. The perfect way to say 'Thank You' to everyone who made your day so special! This stylish thank y..